When I was planning the 40-4-Steve project, there was one item I wanted to add that wasn't about Steve trying something he'd never done. 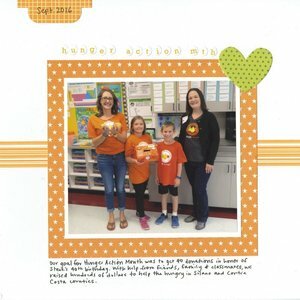 I wanted us to work work as a family to raise money and awareness about hunger issues. You may recall that I held his surprise 40th birthday party at the Food Bank. We've volunteered there and at our church's food pantry many times over the years. In honor of Steve's 40th, I wanted us to get at least 40 donations to the Food Bank. We timed our efforts to coordinate with Hunger Action Month. I'm happy to report that we greatly exceeded our goal through the generosity of our family and friends, as well as Trevor's classmates. This is a good time to remind you all that hunger is an issue year-round, and not just at Thanksgiving and Christmas. In fact, summer is an especially difficult time for those with food insecurity, as children who are out of school are not receiving the breakfast and lunch they get the rest of the year. If you are able to donate food, money, and/or time, it does make a difference. Thank you. What a great idea! I loveeeeeeeeeee your page!!!!!!!!!!!! That's awesome...great job on the donations to the Food Bank.